BlackBerry Pearl Flip officially announced | BlackBerry Blast! 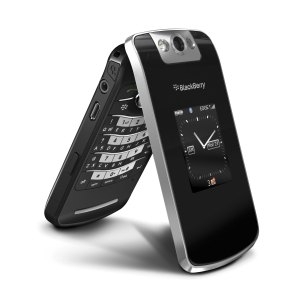 RIM has officially announced the BlackBerry Pearl Flip phone. Once known as the BlackBerry KickStart, the new BlackBerry Pearl Flip "brings the industry’s leading mobile messaging solution to consumers who prefer flip phones." The new BlackBerry Pearl Flip provides flip phone fans with all the power of a BlackBerry smartphone in a fun and familiar design. One quick flip of the handset opens up a world of possibilities with the industry’s leading mobile messaging solution and a wide range of impressive Internet and multimedia capabilities, all in one powerful yet approachable smartphone. You can send a message to your friends or family, make a call, browse the web, snap a picture, watch a video or listen to your favorite song. It’s all in your control with a simple flip. The quad-band EDGE based BlackBerry Pearl Flip smartphone presents a sophisticated look with a sleek design and a chrome-finished frame surrounding its smooth, luminescent face. Packed with an abundance of powerful features, it weighs only 3.6 ounces and measures approximately 3.9” x 1.9” x 0.7”. Featuring two high-resolution, light-sensing color displays, the external LCD makes it easy to preview incoming emails, text messages and phone calls without opening the handset, while the large, 240 x 320 internal LCD displays messages, videos and web pages with impressive detail and contrast.